The idea of designing a robot toy came to me almost a year ago, and I liked the idea so much, it was difficult to wait for the right time to work on it. But I had other projects planned that my time was committed to, so it had to wait. In the meantime, I did some research (an image search for "cute robots" was very fun). Then I drew some sketches that combined my favourite aspects of the images I found, with the basic body style I use for most of my toys. Below you can see one of these pencil sketches. Initially I wanted to make two robots with interchangeable parts. I spent a lot of time on this idea, trying to get the different parts to work together, and trying to find a simple way to make some of the shapes I wanted. In the end, though, the second robot was taking too much time, and wasn't working at all how I wanted. Sometimes you just have to let an idea go, so you can dedicate your efforts to what is actually working. Once I made that decision, the final Spacebot toy came together very quickly. 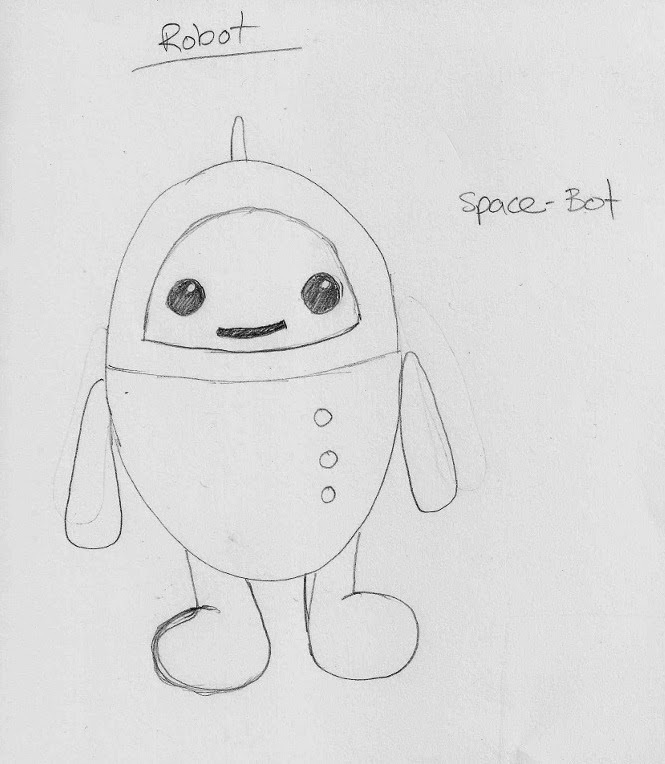 (By the way, it's called a Spacebot because that's what my older son said when he saw the sketch, and I thought that name would be better than the generic "robot"). A special feature of this pattern, which might not be obvious from the photos, is that the Spacebot's head can turn! Early in my design process, the possibility being able to swivel the robot's head seemed like too much fun to pass up, even if it made the toy a little more complicated to assemble. In the end, it actually turned out to be relatively simple, although I made sure to add some extra photos in the pattern to help with this part. Since the final pattern wouldn't have 2 robots, I decided to make my spacebot some accessories. A rocket-pack was a necessity, but I wasn't sure about the second accessory until my husband gave me a little help. When I showed him the two sample toys, he immediately decided they should be called "Domo" and "Arigato". I told him that "Ari" was a nicer sounding name... and then we decided that I would just have to make a robot cat named "Gato" (and now you understand some of the humour you might encounter in our family). With some good scheduling, and the help of two lovely and speedy knitters, the pattern was test-knit while I was busy getting my older son ready for kindergarten (and so didn't have time for work). Some photos, editing, and formatting happened very quickly, and now I have this adorable and fun new pattern to share with you! I would say this pattern is intermediate level, but only because of the intarsia on the body and face. 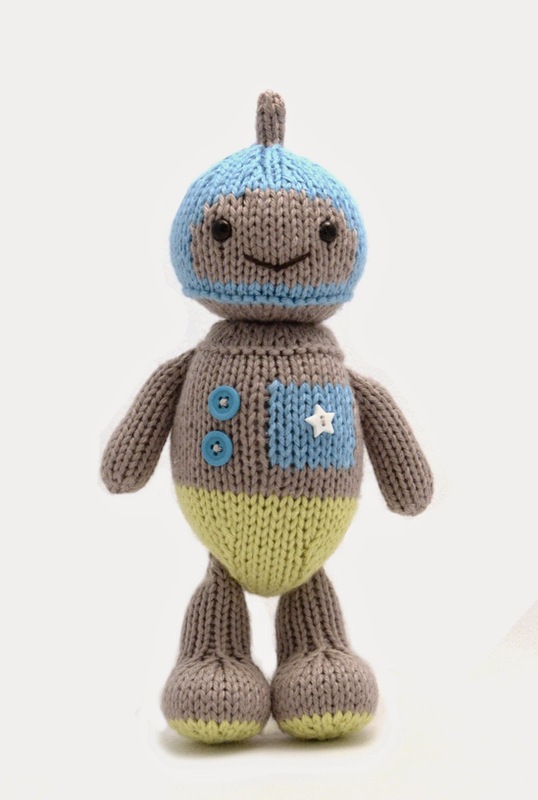 Otherwise, the knitting and construction of the toy is very similar to my other patterns. 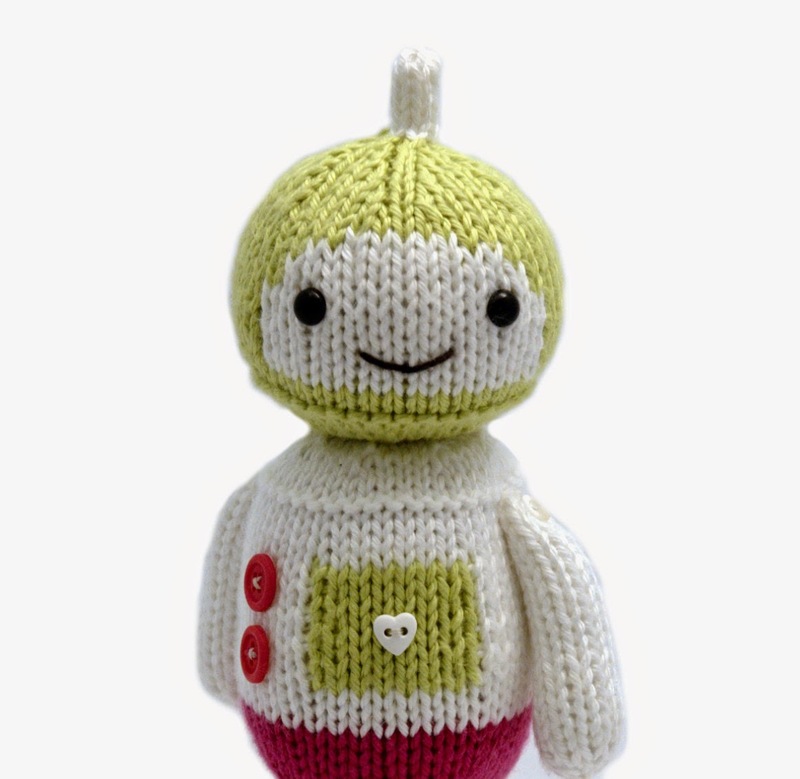 If you really don't want to do the intarsia, the toy would still be cute without it. This pattern is also a great way to play with some of your favourite colours, and to use some of those cute buttons in your stash! 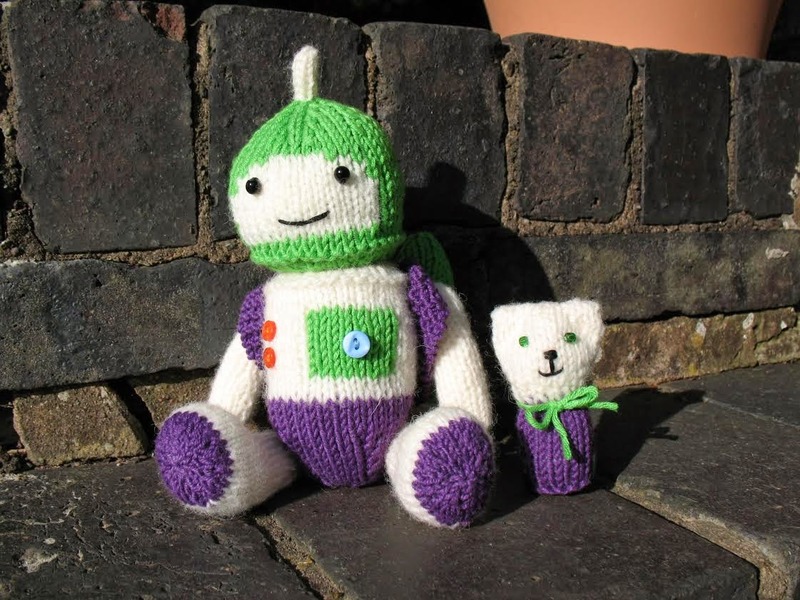 I'm really looking forward to seeing some finished Spacebots, as you find time to knit one (or two!) As a little extra encouragement, the pattern is 20% off until September 19, in both my Raverly and Etsy shops. 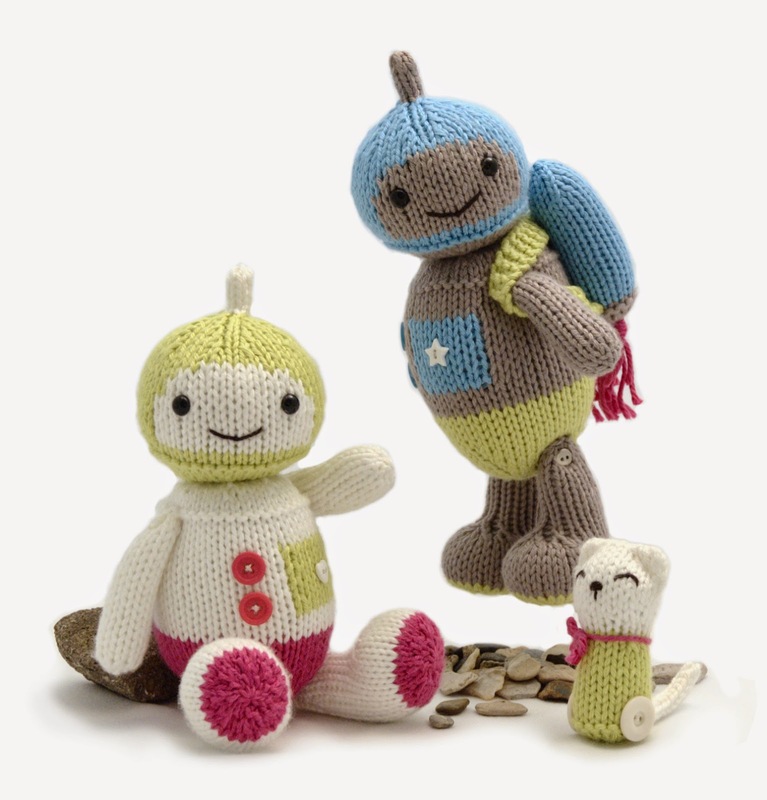 These are the toys my test-knitters made, so you can see how well the pattern turns out (and how talented they are)! 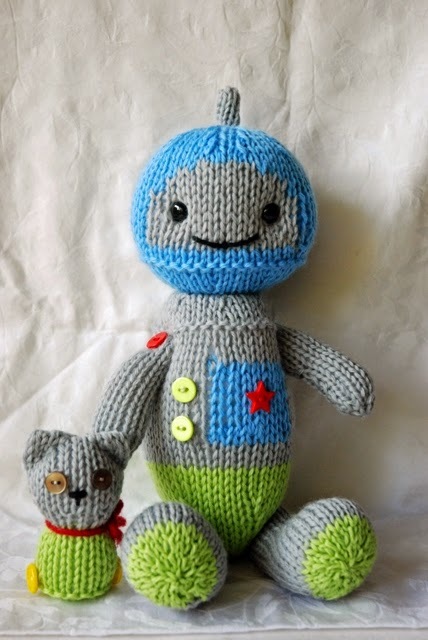 The robot above was made by Nicole (her Etsy shop), and the one below was made by Alessandra. Posted by Barbara Prime at 1:49 p.m. These are just absolutely adorable - you've done such a great job! September 30, 2014 at 12:18 p.m.
October 29, 2014 at 6:02 a.m.
November 16, 2014 at 4:37 p.m.